We’re opening the main travel fair of the winter season. OTM — now from any mobile devices! Thousands of travel professionals, dozens of presentations, new contacts and ultramodern platform. You may find all of it at ONLINE TRAVEL MART: WINTER 2017–18 from 4th till 24th September. We’ve begun the final countdown: ONLINE TRAVEL MART: WINTER 2017–18 — the long-expected fair — will be opened in a week on this Monday. The leading representatives of the travel market will gather together to share new information, plan their work in winter season, find new partners and learn from examples of colleagues and peers. ОТМ is the Russian online fair that opens the tourist season. Traditionally, it is held with support of ANTOR and announced as the major educational event for the members of the first-rate Russian retailers (Union of Travel Agencies, Rosstur and MGP). This year the fair partners are the Greek National Tourism Organization and Karlson Tourism tour operator. All aspects of leisure in Greece in off-peak season will be aired on 6th September, on Greece Day, as a part of live broadcasts by Consul General of Greece in Russia Eleni Vakali. Specialists of Karlson Tourism will present authorial tours and programs to Thailand, Sardinia, RSA, Maldives, France and Switzerland. This year representatives of almost all segments of travel market will take part in OTM introducing their services in different price tiers, from mass market to luxe. Novelties of the season and all aspects of the most popular winter destinations — beaches, Alpine skiing and guided tours — will be presented by leading tour operators. Experts of ANEX TOUR will tell everything about skiing season in Andorra, PAC Group will present the comfortable Alpine leisure and ART-TOUR will entirely unveil the exotic of Australia and New Zealand. All in all, 18 known tour operators will participate in the fair: TUI, DSBW, Emirates Holidays, Quinta Tour, CruClub, Acti Tour Russia, Viapol, Beleon Group, Maldiviana, ClickVoyage, Inflot and others. 6 international airline companies will introduce their flight programs for the winter season to attendees: Etihad Airways, Alitalia, Finnair, Cathay Pacific Airways, Hainan Airlines and Czech Airlines. 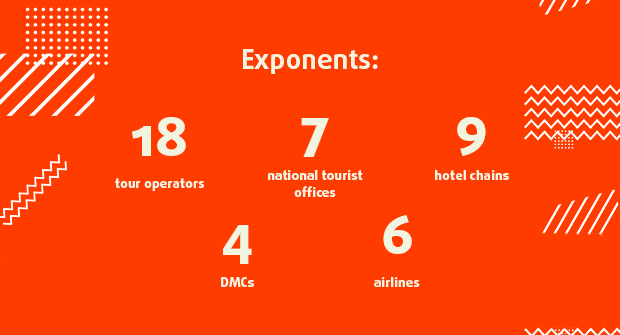 There is a great number of world-famous hotels and hotel chains among the OTM exponents — Vinpearl (Vietnam), Barceló Hotels & Resorts, Centara Hotels & Resorts, Pimalai Resort & Spa, Mövenpick Hotels & Resorts (Thailand and UAE), etc. The list of Profi.travel fairs exponents gets bigger with each passing season. Guam Visitors Bureau and Bahrain Tourism and Exhibitions Authority will introduce the destinations in OTM winter for the first time. The tourist opportunities will be also presented by experts of Macao Government Tourist Office, Vienna Tourist Board, Catalan Tourist Board office in Eastern Europe and the CIS and Greek National Tourism Organization. Owing to wide audience and lots of familiar presenters, the OTM online fair opens a season giving a general picture of travel market. Every attendee can clearly see the new market players and trends of the last several months and, on that basis, correct the growth plan of his own company. The schedule of three-weeks event mentions all aspects of winter holidays abroad. Special focus will be on the most requested destinations: Profi.Travel will held editorial broadcasts devoted to beach holidays in Southeast Asia, Christmas and New Year tours to European and Asian countries and skiing resorts of Andorra, Italy, Bulgaria and Georgia. ОТМ appearance is an big deal for the whole travel market: the majority of its participants are thorough in attending the traditional offline fairs, increasingly money-losing and less effective. For many companies, OTM is a real chance to improve the effectiveness and sales growth of tours and destinations. Numerous famous experts, wide topic area and huge audience make OTM the main online fair of the tourist season. This season the OTM fair got mobile for the first time. Owing to advanced developments made by Profi.Travel team, you can easily visit the main page, join the presentations and read the materials of the fair from any tablets and mobile phones. Which means that everyone can learn the tourism product anytime and anywhere: in a traffic jam and transport, at home, along the way, wherever! From now on, the online fair attendees don’t have to change their daily timetable: they can watch the webinar while treadmill training, waiting for the plane in the airport, being on vacation or at lunch. We say for sure that today this is the first educational platform in Russia which is available from all mobile devices without downloading any applications. However, that is not the only novelty. Specifically for OTM, we prepared the technological and multifunctional e-learning platform and developed the brand new main page of the fair. Now the OTM main page reflects everything on the event at the moment — which presentation is on and what is planned shortly. Besides of that, new possibilities of platform allow to see the profiles of all fair attendees and know what they do. All you can see on the main page: who joins the presentation, who downloads catalogues and who is temporarily offline. The important peculiarity of the new fair is the platform integration with social networks. Everyone can register at the event with one click, share the presentation or attendee diploma at any time. And most importantly, the fair is now available to watch in social media such as Vkontakte, Facebook and YouTube. New technological possibilities make the fair more user-friendly for attendees and exponents and attracts new participants. Over 3,5 thousands of travel professionals attended the online fair this spring. Autumn OTM will gather together even more attendees: thousands of travel industry professionals valued the fair as the instrument to prepare for the upcoming season to the full, with minimum time and cash expenses. The graduates of ONLINE TRAVEL MART: WINTER 2017–18 don’t have to look for the additional details about tours, flights, hotels, discounts and booking conditions in hundreds of miscellaneous sources. All needed information will be professionally “packed” by fair organizers.